This book constitutes the thoroughly refereed post-workshop proceedings of the 10th International Workshop on the Implementation of Functional Languages, IFL'98, held in London, UK, in September 1998. The 15 revised full papers presented were carefully selected during two rounds of reviewing. The volume covers a wide range of topics including parallel process organization, parallel profiling, compilation and semantics of parallel systems, programming methodology, interrupt handling, strictness analysis, concurrency and message passing, and inter-language working. 7. 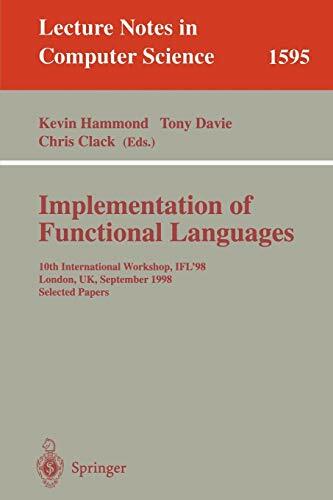 IMPLEMENTATION OF FUNCTIONAL LANGUAGES: HAMMOND KEVIN ET.